There seems to be a fine line between rock collecting and rock hoarding. Rock collecting brings to mind the scientific collection of specimens. Hoarders just haphazardly pick up and keep any rocks that appeal to them. 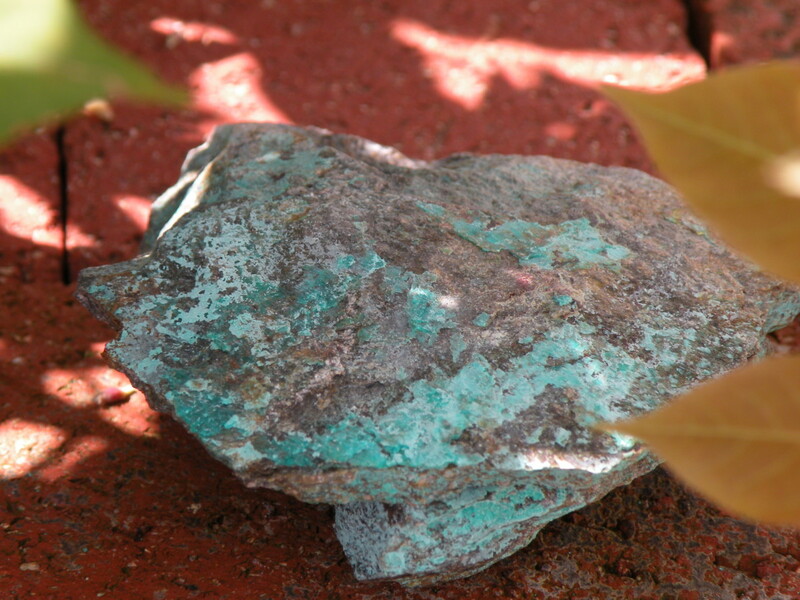 "the selfish acquisition of possessions...even if the items are worthless, hazardous, or unsanitary"
It's easy to cross the line when you begin to pick up every pretty, shiny, interesting rock you see. 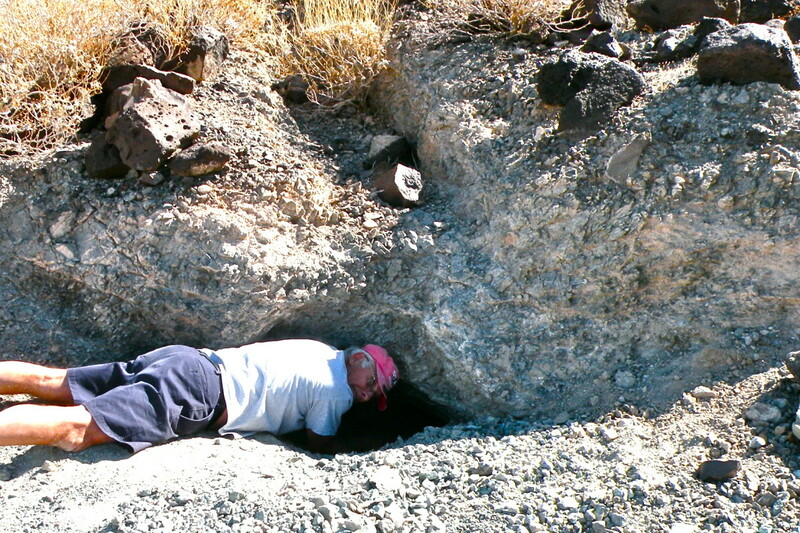 Anyone who camps in the desert understands the lure of rock collecting. You’re surrounded by rocks. Rocks in your campsite, rocks on the roads. On BLM land, the dispersed campsites are often outlined with the rocks that people have collected through the winter season. Snowbirds who boondock in Arizona and other warm climates make rock jewelry and cut and polish rocks. They collect fossils and search for gemstones. Some snowbirds look for gold and go off into the desert with their gold panning equipment. 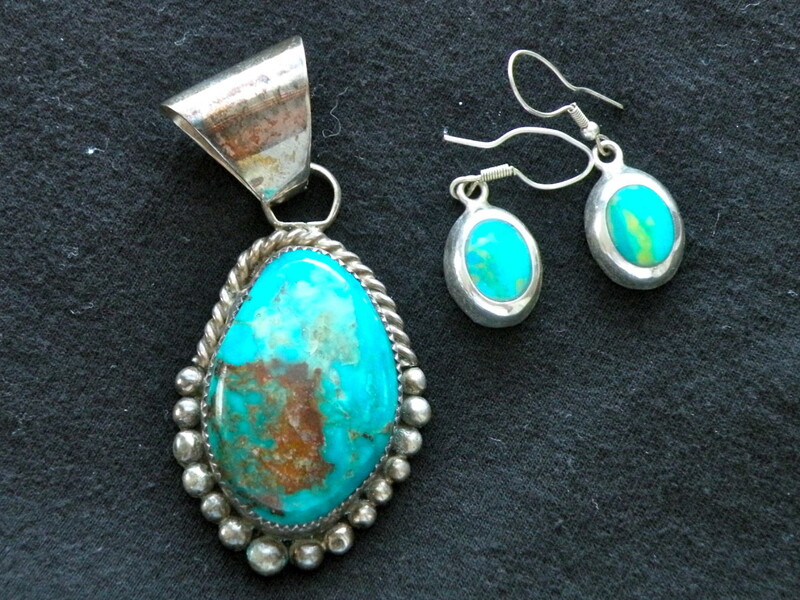 Others search for turquoise on the desert floor or in old turquoise mines. With all the opportunities available to rock hounds, it’s nearly impossible not to succumb to the urge to collect rocks when you are camping out or hiking those interesting trails. But you don't have to go camping to become hooked on rock collecting. Anyone who walks outdoors can be tempted to pick up the rocks along their path. Visit a park, forest or beach and you might find yourself picking up some shinny orange rock or a piece of pretty quartz or an agate. Before you know it, you have a pocketful of stones, then a bag full, then a bucket full. It's definitely easy to become hooked on rock collecting. 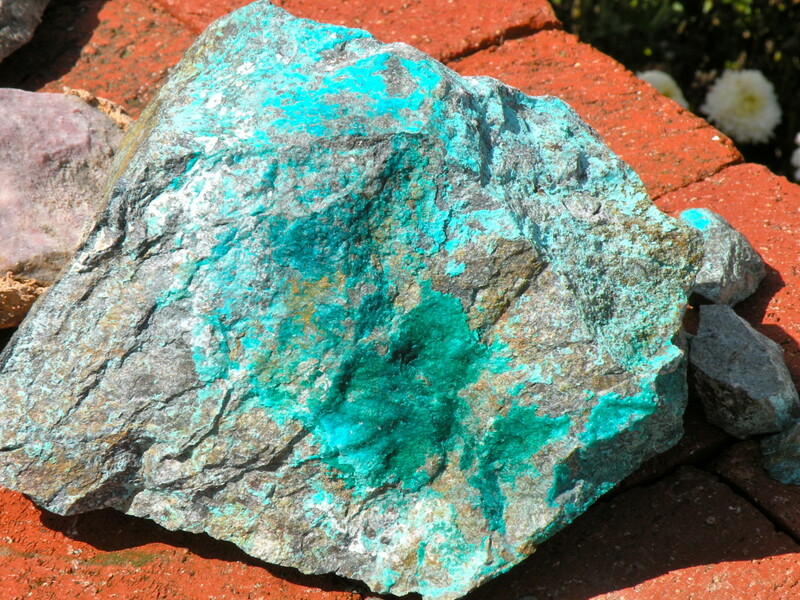 If you've ever been interested in rocks, you know that there are serious rockhounds and also casual collectors. Serious rockhounds learn rock and mineral identification and carry their field guides, rock picks and gad bars on their belts. They know an agate from a quartz. Their collections are carefully categorized by name and type and labeled with date and location where they were found. Serious rockhounds haunt the rock and mineral shows, trade specimens and own their own cutting and polishing equipment. They are not to be taken lightly. 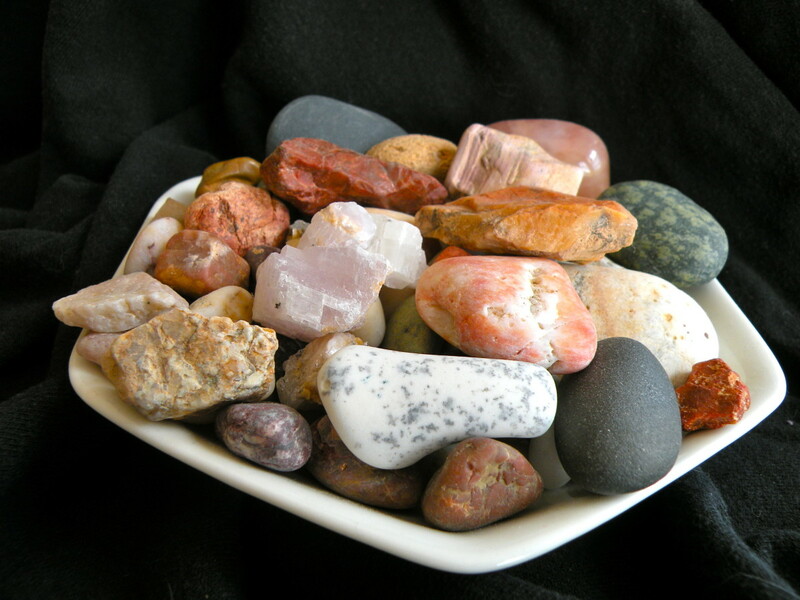 However, both kinds of rock collectors love rocks, fill their RVs and homes with rocks, hoard rocks in every available space, and always want just one more beautiful rock! Rock collecting is cheap! If you collect your own on your walks and hikes, rocks are free! Rocks are readily available! You can find rocks on the beach, in the mountains, by the lake, in the desert or in your driveway! Rocks are interesting and beautiful. Each rock is different, with different colors, shapes, textures and consistencies. Some are very beautiful. Rocks have history. Some rocks contain fossils tell a story of prehistoric times and of the formation of the earth. Rocks are useful. Rocks have been used as tools and building materials since the beginning of civilization, but the collector can also make them into jewelry and decorative objects. Primitive people knew that rocks could be made into useful items like spear heads, arrow heads, hammers, mortar and pestles, jewelry and beads. Rocks like granite, marble and travertine (a form of limestone found near hot springs) are cut into slabs and used for building materials, floors and walkways. Obsidian, a black volcanic glass, is used for making scalpels and knives, beautiful wind chimes and carvings. Marble and granite is used for sculptures, headstones, buildings and monuments. Jewelry is fashioned from many, many different rocks and minerals. 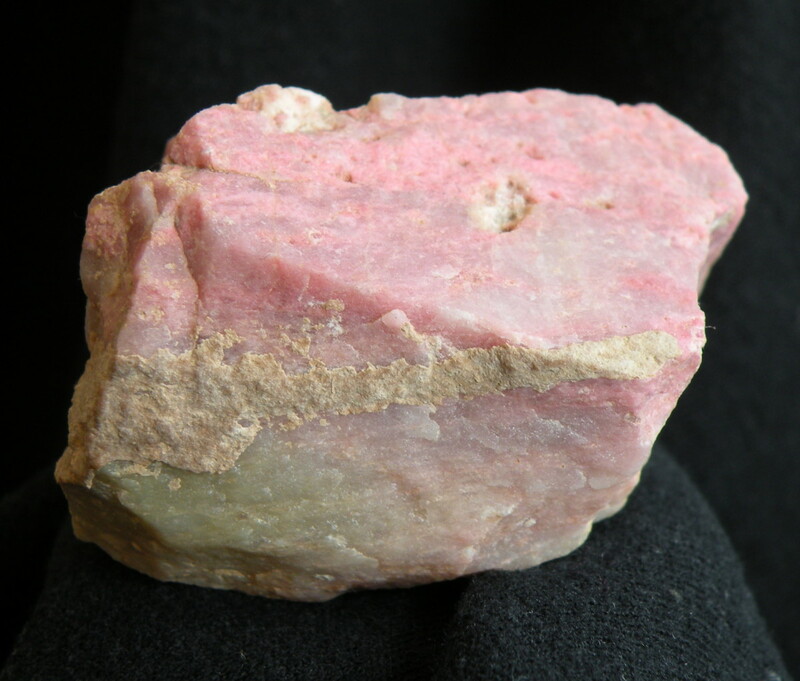 Household items like clocks, picture frames, bookends, paperweights, ashtrays, figurines can be made from petrified wood, jade, turquoise and other beautifully colored and patterned rocks and minerals. Large chunks of rock are made into benches, sculptures, lawn ornaments and landscaping focal points. When you are a rock hoarder like myself, you may need a few excuses to pick up one more rock. So I've developed a list of more creative uses for those collected rocks. Use rocks as decorations around flower beds. 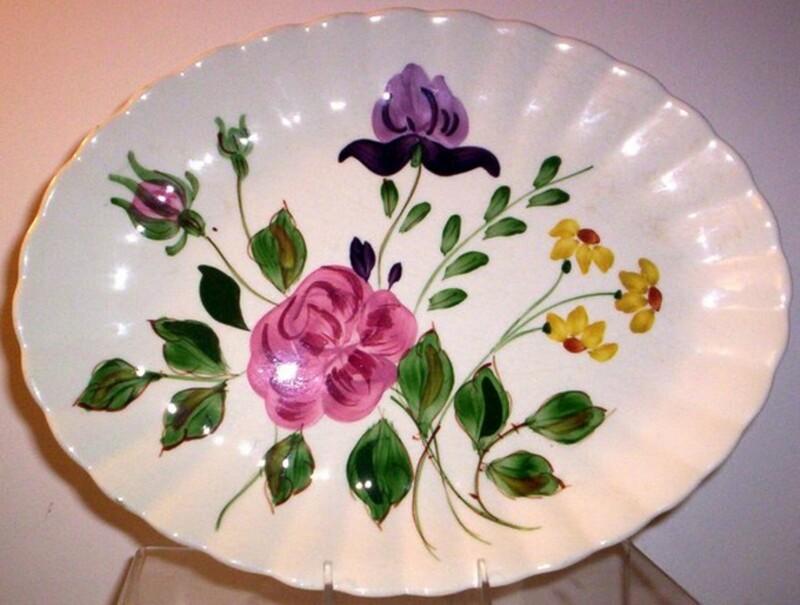 Place rocks in decorative baskets or pretty dishes around the house. Keep a few rocks handy for defense purposes. Add pretty rocks to indoor fountains or planters. Hide a key under a rock. Add some to your aquarium. Put a few favorites with your plants in your indoor flower planters. Fill a pretty vase with colorful rocks, and add water to bring out the colors. Line the edges of flower beds with rocks. Glue some felt or cork to the bottom and use the for doorstops or bookends. Years ago Lucille Ball and Desi Arnaz starred in a movie called The Long, Long Trailer. It was a hilarious account of their adventures traveling across country pulling a camper trailer. Lucy became fascinated with the rocks along the way and began picking them up and putting them in the trailer. Despite Desi’s warnings not to pick up more rocks, she stashed them in closets, cupboards and every nook and cranny. Needless to say, her rock collecting backfired when rocks started breaking loose and rolling out of their hiding places. "LUCY! You've got some 'splaining to do!" Sometimes my husband accuses me of being like Lucy, because I do stash my rocks in all the nooks and crannies of our RV and in the little Jeep Wrangler that we tow behind it. I have baggies of small colored rocks in our kitchen drawers and in the bedroom closet. I have larger rocks hidden in the bottom of my clothes closet and in our basement storage compartments. There are coffee cans full of chalcedony and pretty, naturally polished desert stones. 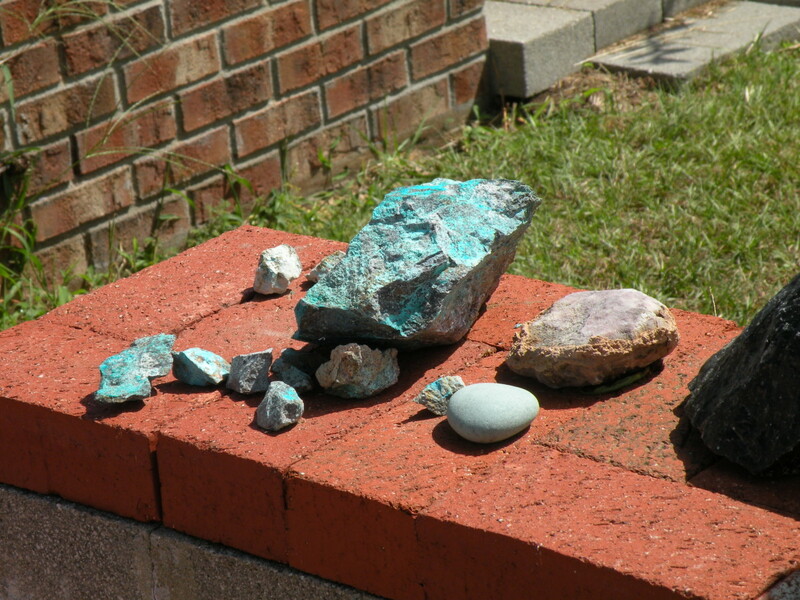 I have a separate place for rocks with flakes of turquoise, petrified wood. There are chunks of glittering white quartzite from Arizona and shinny black obsidian from California. A few pounds of rocks were picked up along a beach on the Upper Peninsula of Michigan. Rock Hoarding: Is It the Same as Rock Collecting? Rocks are heavy. Added weight reduces gas mileage. Rocks take up space. Space is very limited in an RV. Check the legality of rock collecting before picking up rocks. Rock collecting may be limited or banned in certain places. For example, you can't pick up petrified wood in the Petrified Forest National Park! Most National Parks have some limits on how many pounds of rocks you can collect, so do check them out before loading your backpack with pretty specimens. Don't forget to take some water, both to drink and to rinse off dust to get a better idea of what your rock looks like. Rock collector or rock hoarder? Do you like to collect rocks? Yes, I love to collect pretty rocks during walks and when I travel. I only collect rocks that are good specimens for my collection. Yes, I collect rocks and have baskets and boxes of rocks - maybe I'm a hoarder! Whether you are a serious collector, an amateur geologist or just love to pick up pretty stones, collecting rocks is a fascinating pastime. You'll have some interesting and free souvenirs of your travels that you can display in a variety of ways, indoors and out. This is an especially fun hobby to share with children as they can collect on so many different levels, depending on their age and interest. Do encourage those budding geologists! Do have fun on your next rock collecting outing! How do you clean rocks from the southwest desert? I clean my rocks by putting them in a bucket of water with some mild soap and letting them soak a while to loosen the dirt. Sometimes I use a toothbrush to clean out indentations and cracks. Then, I rinse them with clear water. Where can I find information on how to make jewelry such as rings out of Petoskey stones? 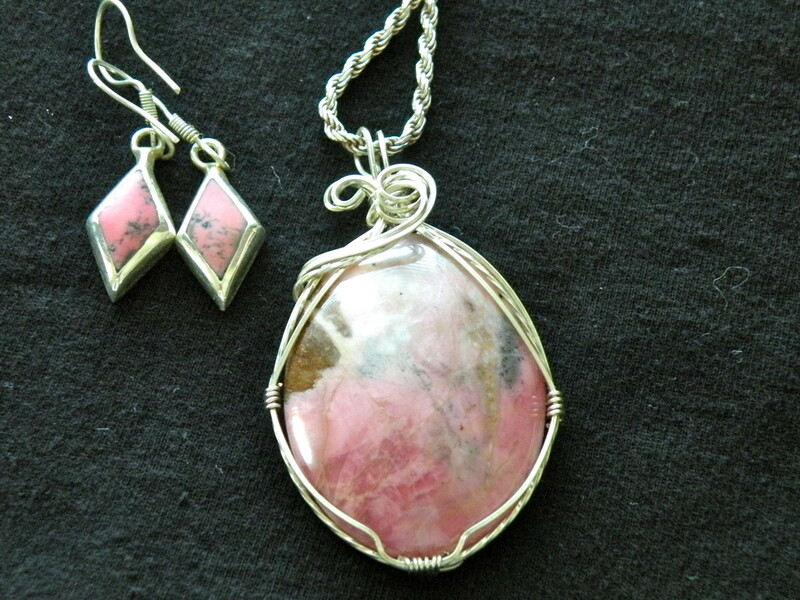 There are many books and articles on how to do wire wrap jewelry. I think this would be one good way to make jewelry from Petoskey stones. Try an internet search. I enjoyed reading about rock collecting. When I was a young boy into my late teens I loved to collect rocks. I lived in the Pocono Mountains of Pennsylvania. If you have ever been there you would know how rocky of a terrain it is. I loved looking at your photos, such beauty in those rocks. 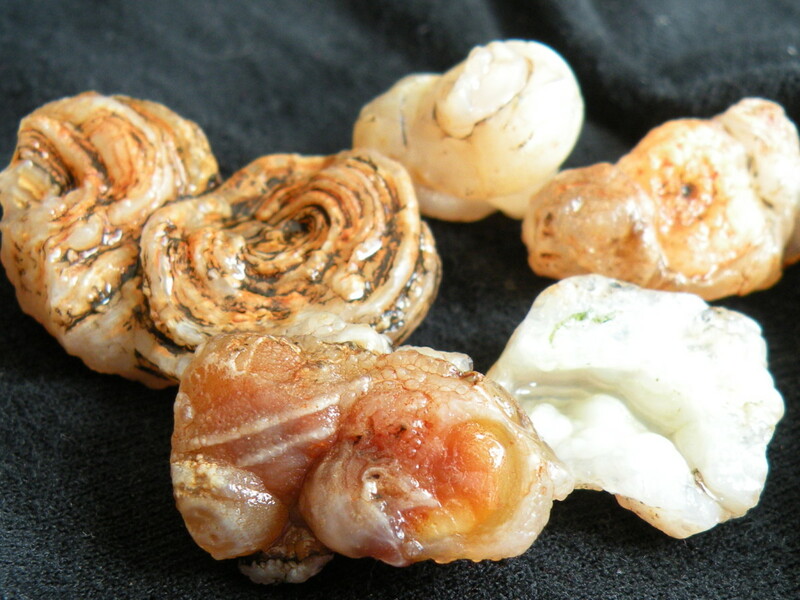 Rocks can be made into some fine pieces of jewelry as you have shown here. Hi Helen, I'm definitely not an expert on this. I've had some geodes that were broken open and found some loose pebbles as well as crystals inside. If you are unsure what to do, you might contact a local geologist or a rockhound club for help. Hope you find a treasure! 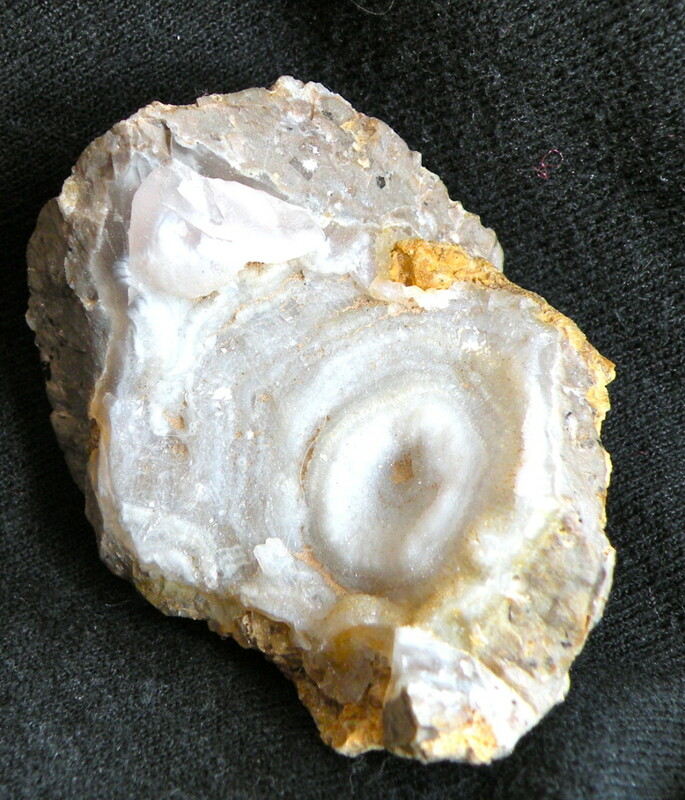 I don't want to talk too much, but I discovered a little geode, split in half, in my collection this morning. The advice is all on how to break one, but this one is already in half, but covered over with a white substance that was chalky at first glance, and I did a little scritching on it (looking for jewels) and one area is showing up spidery red, and the white area is very chrystalis but not as hard. What should I do? I've barely made a dent! Helenstuart - How exciting it must be to find such wonderful artifacts! I live in Mid Texas, hub of the main discovery of pre-clovis artifacts. I have found some artifacts that completely astound me, and a lot of spear points and ax-heads. Also crystals bigger than your fist, and petrified wood and effigies. Now It is so hard for me to leave a rock on the ground. I haven't had time to learn about all I have collected , but I know a great majority are tools. They are probably about 20,000 years old, much older than ever found in North America, I live only about 100 miles from the first discovery of these crude but ingenius tools and weapons. 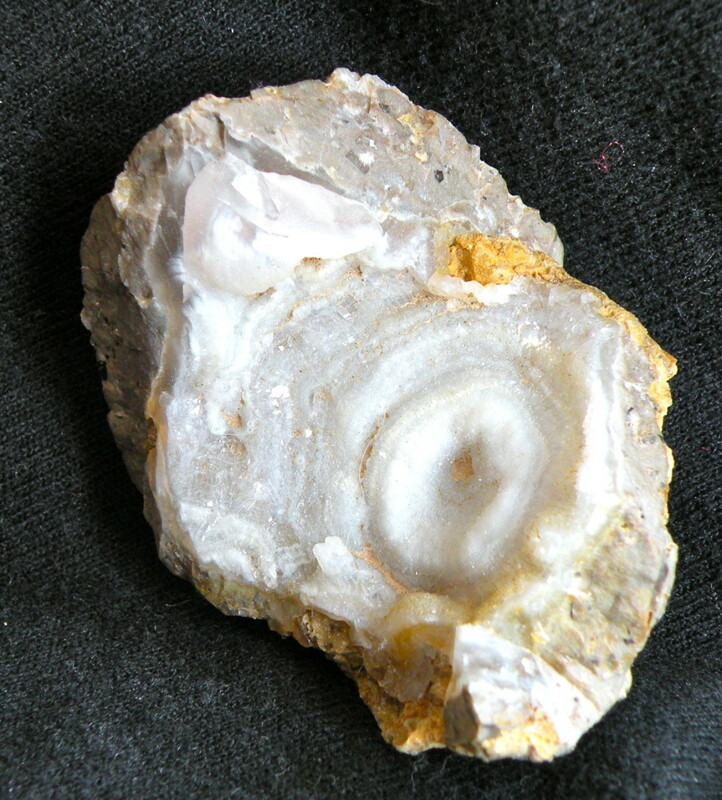 Mechesier - I still sometimes have trouble recognizing a geode, but isn't it wonderful when you do find one? Happy rock collecting, and thanks for the visit! What a magnificent Hub! I am a rock hound from way back. I used to go rock hunting with my grandparents. They taught me how to recognize a geode. Thank you for the wonderful tips and tricks. Voted up for useful and interesting! Wabash annie - It's nice to meet another rock and gem collector! I imagine that you have some wonderful opportunities to collect unique and beautiful rocks in Colorado! Glad you enjoyed my article. Thanks for reading and commenting! I took some university geology and physical geography classes a number of years and will admit I am hooked on rocks and gems. They can be so very unique and beautiful. I enjoyed this hub so very much! Moonlake - I never did find any Petoskey stones, though I did look. How nice that you were able to collect some! We spent a few weeks camping in Michigan, and along Lake Superior -- I did love the stones I found along the lake shore. Thanks so much for stopping in to read and comment, and thanks for the share! I love rocks but I'm not a real collector. I have some cans full of rocks I collected at Lake Superior. We also have a few odd looking rocks around the house. I use them as decorating pieces in room. My favorite is Petoskey stones. Voted up and shared. Mike Robbers - Your mother sounds lovely, and her hobby of collecting rocks on her travels is much like mine, I think. Rocks collected during our travels serve as wonderful mementos of beautiful places and great memories. Thanks for your comments and for the share! Tillsontitan - Rocks are fascinating, and something that anyone can collect and enjoy, Thank you for your very nice comments! My mother is a rock hoarder.. she travels and walks quite often and she always collects baskets and boxes of rocks. Her house is surrounded with hundreds of beautiful and interesting rocks .. I think that her hobby is truly enjoyable and spiritual, I admire her so much. There's a bit of the rock collector in all of us! Some just because as you've stated, some "for our gardens", whatever the reason people just seem to like rocks! This was a great subject to write about Stephanie and you've covered it so well with truly lovely pictures! Glimmer Twin Fan - Glad to see you again! Thanks for the share! 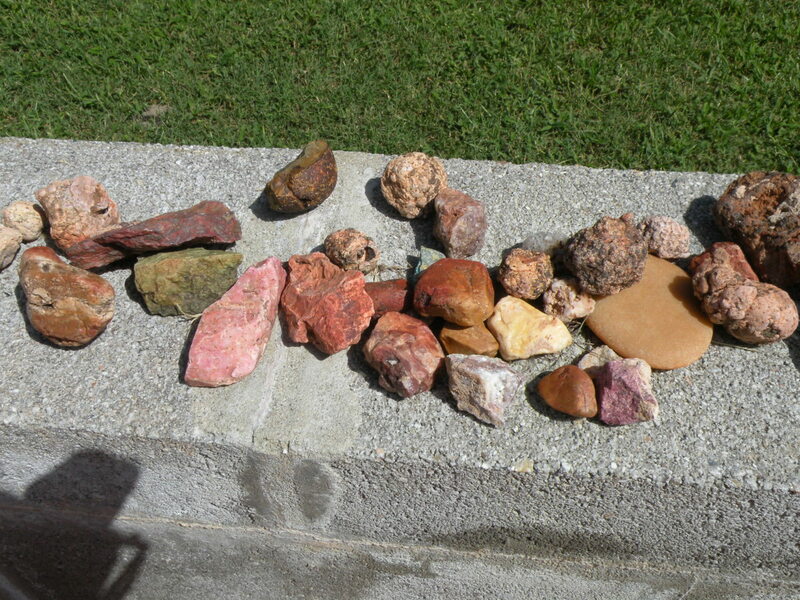 As children, my brothers and I would collect different types of rock in the Virginia mountains. In the area we lived in there was plenty of shale and for some reason we thought that was really cool rock. Creek beds also have a variety of rock that we apparently thought was something remarkable. Oddly enough, reading this triggered those memories. Thanks for sharing your knowledge. thanks for sharing..... Voting up and awesome! Back for another visit. I love this hub and it reminds of summer rock picking. Sharing. pstrauble48 - I'm so glad you enjoyed my Rockhounding hub! If you go to Arizona you are sure to see many beautiful sights, and perhaps finds some beautiful rocks to take home. Even if you don't find them by hiking the deserts, there are so many rock shops in Arizona, that you're sure to have a great time exploring them for treasures! Thanks so much for your kind comments. It's always so nice to have you visit! Jaw dropping. The photographs are amazing. I have always been an admirer of rocks but have never really been anywhere that I could find such as these. You are so fotunate. I am coming to Arizona next summer with my sister so hopefully I will get to see some like these then. ChristinS - It's funny how we get hooked on our collecting, isn't it? I'm sure your little owls are delightful even if everyone doesn't appreciate them. :) Rocks do have a treasure of history. They bring back treasured memories, but also contain their own geological history. They can, however, quickly overwhelm a small space! I'm so happy that now I have a place to unload the RV and can keep my rocks on my garden wall and in various other places in and out of doors. I really liked your hub. My grandparents actually started my love for rocks. When I was little they had a rock well and it was surrounded by rocks they picked up from all of their travels. I love the beauty of them and the history contained within them. I have a smaller collection than they did, but I find myself drawn to many different rocks and stones. I can see how they could quickly overwhelm an RV :) I had to chuckle at the Lucy reference there. In our house it's that way with my owl collection - I have so many owl statues, figurines, etc. that they peek at you from every nook and cranny of this house. Every time I get a new one I see the little eye rolls going on lol. Great hub voted up and shared. I used to have an air well full of rocks and plants, but we had to move. Rocks have many creative uses, as décor or paper weights! a great idea for a hub! An informative, cheery hub about rocks! Have to admit I am almost a 'hoarder'...not as bad as you though. :-) Your travels must have been infinitely interesting for nature scenes, different travel places...and those ultimately beautiful rocks. 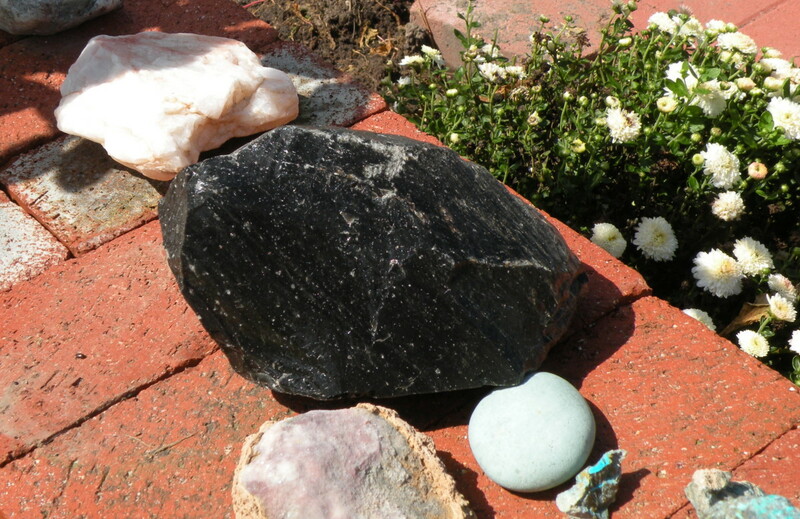 I am 'intending' to write about Arizona's beautiful rocks--including black nephrite jade and multi-colored jadeite - that were discovered, validated and mined by my deceased stepfather. I would like to link to your interesting hub whenever I accomplish that if you don't mind. Thank you so much for sharing your information and pictures here! Tammyswallow - When there are so many pretty rocks around, it's hard not to pick them up. Seashell and seaglass collecting is also addicting - I can see why you hoard them for your beautiful crafts! Thanks so much for stopping in to read and comment! If I saw rocks like these, I would definatley keep them. I LOVE the paperweight. I only have a few rocks but my hoarding item would be seashells and seaglass. I try to do crafts with these, but the seaglass is challenging. I love your photos. I can see why you love them. TToombs08 - I can imagine how devastated you were when your rock collection disappeared.How lucky you are to be married to someone who understands you and your rock collecting nature. Thanks for sharing your memories here, Terry! I admit, I'm a rock hoarder, and I blame it on my father! When he would be stationed overseas on unaccompanied duty, he'd always send me back rocks. Then, when I was older, we would go hiking and bring back fossils and rocks. I loved my collection, each rock had a special memory. My mom, not understanding this, decided to clean my room when I went to Girl Scout camp and tossed my rock collection out. I won't go into what a cruel and twisted woman she was. Great idea, Peggy! I'll add a link to your hub here, too! I just added a link of this hub to mine about rocks. It will make a nice addition! I love that "I love Lucy" episode! Haha! I love to see the transformation of rocks from their natural state to a polished stone, and the rock jewelry found in the Southwest is so varied and beautiful. Thanks so much for stopping in to read and comment! 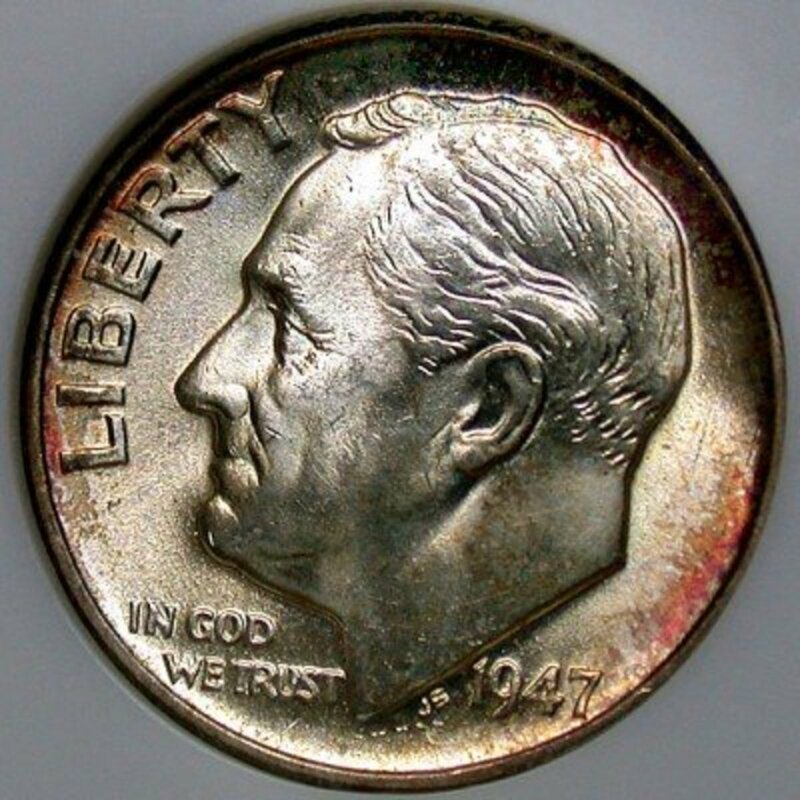 Great hub, especially since I remember watching the Long, Long Trailer movie with Lucy and Desi and could so vividly imagine you stashing your rocks away! I don't usually collect rocks but I do love them, especially the smooth ones I see on the beach. Love the jewelry in this hub. Peggy W - Thanks for bringing my attention to your hub on rock collecting - it's one that I missed. I am fascinated by beautiful rocks, though I don't usually try to stash them in my suitcase when flying. :) Seeing my rocks on my garden wall and around my flower beds always brings back lovely memories of the places I found them. 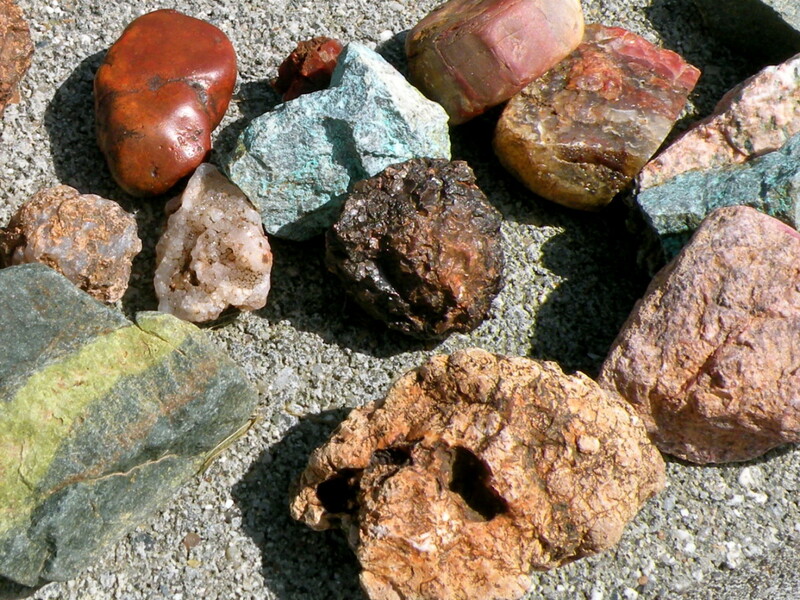 Besides collecting for their beauty and interest, rocks can be a great souvenir! Thanks so much for the read, comments and share! One of my very first hubs was "I've got rocks in my head...oops!...I mean bed" if this gives you an idea of my love for collecting rocks. I have them lining my garden beds and other areas. 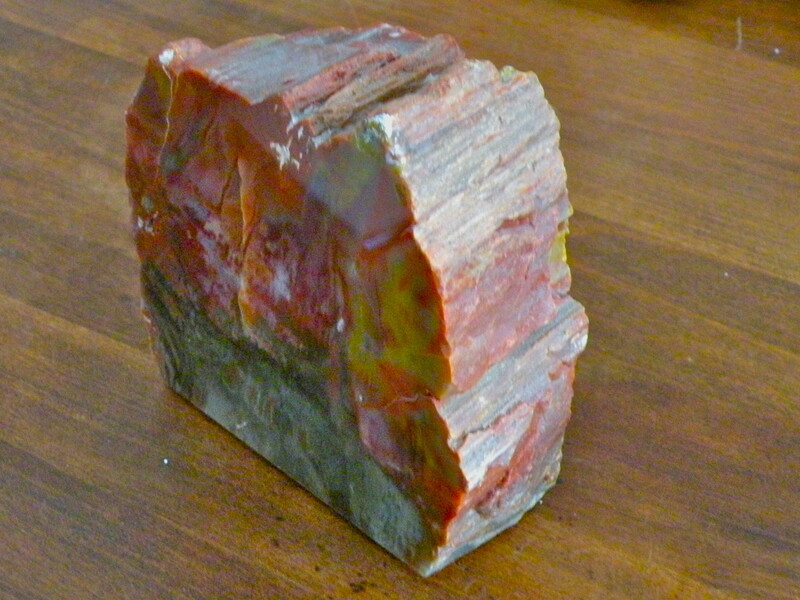 I have also purchased petrified wood as bookends and just love the looks of beautiful rocks. Yes they are heavy...especially when bringing them back in suitcases when flying. I did that years before all of the new weight limits went into effect. We are very much alike in our fascination for the pretty rocks. Loved this hub! Up votes and sharing. Movie Master - I understand exactly where you are coming from! I do love the beauty in rocks, whether they are small enough to pick up or giant rock formations. The rock I picked up in Arizona has mystified me from the beginning. 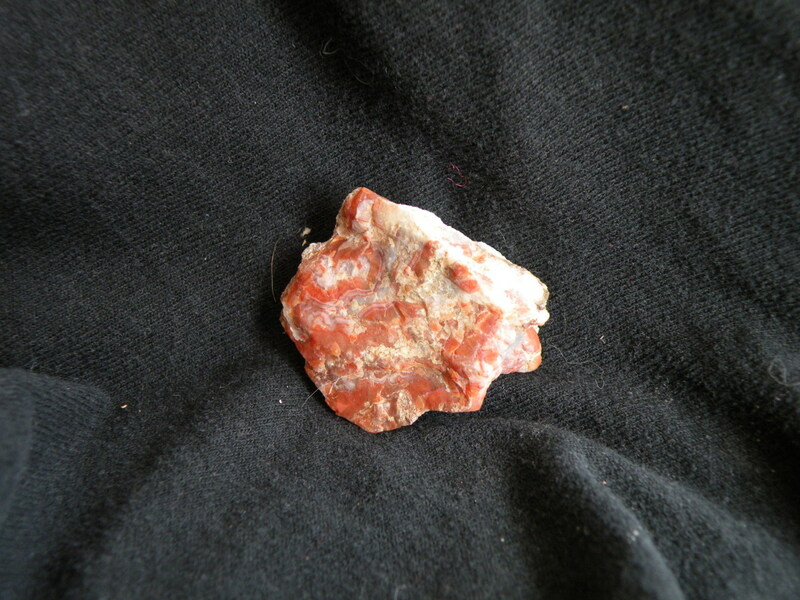 It looks like a fossil to me, but someone who knows Native American artifacts thinks it might actually be a carving. Someday I will take it to an expert to get more information on it. Thanks so much for sharing your comments here! I am a rock hoarder, I love collecting rocks - I know nothing about them - I see only the beauty in them! Going home with pockets full of rocks means I've had a great time! I use a lot of them in the garden, I think they look great around flower beds. The rock you found in the Arizona desert looks fascinating! A wonderful hub thank you and voted up. Point2make - I'm not sure I'd know a meteorite if I found one, but it sure sounds like an interesting thing to look for on our walks in the desert! I also enjoy looking for fossils. We used to live on a farm in Central New York that had many fossils. We loved collecting them, and I still have one very large rock that lives in my flower bed that is full of fossilized sea creatures. Enjoy your rock and fossil hunting! I enjoyed your great hub very much Stephanie. Thanks for all the great info and I loved your photos. 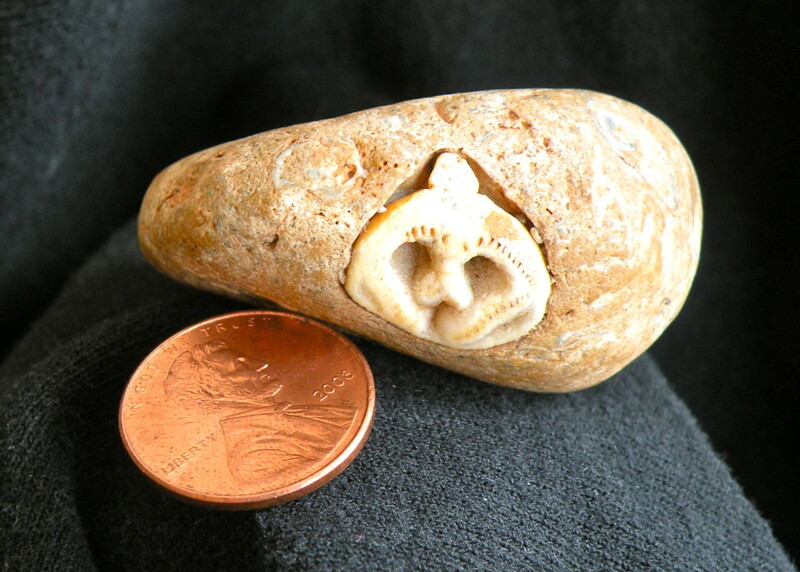 As for myself, besides metal detecting, I hunt fossils. They are not really rocks but their close. I also search for meteorites. I must admit that in my travels I see a lot of interesting "rocks". After reading your hub I think I might have to add another target for my field trips......although I don't know how I'm going to break the news to my wife. Starstream - It's interesting that you transitioned from rock collecting to jewelry making...I can see the logic in it. While I'm fascinated by the process of cutting and polishing stones for jewelry making, I don't have an interest in doing it myself. Now making the jewelry is another story! That would be so much fun! Thanks for sharing your comments here! I enjoyed rock collecting years ago. Then I admired the jewelry made with rocks and took a class in cutting and polishing a stone. Now, that is not my cup of tea but... loved the finished piece and now purchase finished cut stones and make a necklace or earrings. Very interesting subject and it is full of valuable information too. Kashmir56 - I love to pick up rocks on beaches as they are usually polished smooth by surf. They make a great addition to a garden landscape! Thanks so much for reading and commenting! Hi my friend great hub enjoyed reading it. I find rocks on the beach near my home and bring them home for my yard and garden. Austinstar - Thanks so much for the interesting Hawaiian rock lore! I remember seeing some of the rocks and notes on display at the Haleakala National Park visitor center that people had sent back because they thought that they were having bad luck as a result of taking rocks away from the volcano. I didn't realize that spirits of Hawaiian ancestors could be inhabiting the rocks! I'm afraid that my rock collecting is rather haphazard, but I do enjoy it. Thanks for stopping by to read and comment! Sally's Trove - I like your observation that rocks are so basic that we humans have a spiritual connection to them. One of the things I didn't talk about is the special meanings that certain rocks and minerals have for different people...but that's a whole other story! Rocks appeal to me as an artist for their colors, shapes and textures, but there's also something mystical about finding a rock with a fossil embedded in it or one so smooth that you wonder if it has been fashioned by a human. Thanks so much for continuing to read my hub and for your insightful comments! Oh, I do love my little pretty rocks. I like river rocks the best. 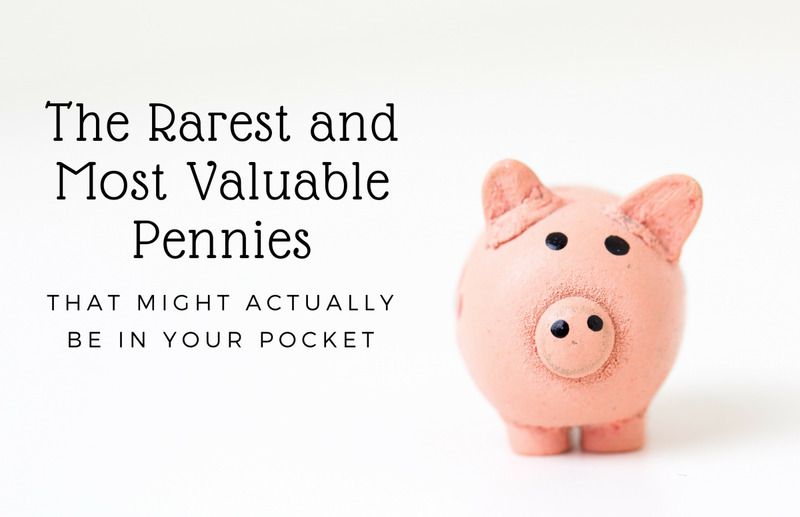 I don't really collect them, but I do have a few in vases or on my window sills. While living in Hawaii, I learned that collecting rocks was bad luck as the Hawaiians believe the spirits of their ancestors inhabit the rocks. At Haleakala National Park, they get literally tons of rocks in the mail that have been returned by rock collectors visiting the volcano. If you hike the trails in Hawaii you will also find stacked rocks everywhere and the rocks are wrapped in banana leafs or some kind of leaves. The Hawaiians get very upset and angry if tourists disturb the rocks. I tried to make a rock garden here at my house, but the weeds persisted in growing up through the black weed blocker and the sand, so I just gave it up. Enjoy your hobby! Collecting rocks is fun. When I saw the subject of this hub, I thought, well, that's interesting but nothing that really grabs my fancy. Then I read a few of the comments and thought, wait a minute! I do have rocks squirreled away here and there, inside the house and out, not to mention large-scale drawings I've done (many, many years ago) of collections of river rocks. In some unintentional way, rocks have grabbed my attention now and then, enough to keep them or draw them, although they've never been a hobby or even persistent interest. You know, I think maybe there's something so basic about rocks that we humans have a spiritual connection to them whether we know it or not. rcrumple - Haha...I haven't had to toss any rocks so that we can get over the mountains...yet! The day might be coming! Now how did you manage to get rocks from the French Alps home? That's got to make those suitcases pretty heavy! Glad you enjoyed the hub - thanks for your comments! When I first saw the topic, "The Long Trailer" came immediately to mind. I could see you outside of your RV trying to decide which ones to toss to get over the mountain ahead. I still have a couple of rocks from the French Alps stored somewhere, but my wife accuses me of having enough in my head that the house needs no more. Isn't marriage wonderful! Glimmer Twin Fan - I do love to collect rocks along the shores of the Great Lakes! We were in Petosky, but weren't there long enough to find any Petosky stones -- next trip for sure! Glad you enjoyed the article on rock collecting. Thanks for your comments! Oh, DzyMsLizzy, you are a gal after my own heart! :) I keep telling my husband that I will dump all my collected rock into my flower beds, but I can't bear to get them all muddy. Putting the rocks into jars of water is a great idea for bringing out the colors. I've also heard of people putting them into mineral oil. Just think how surprised your daughters will be when they discover their "inheritance!" Thanks so much for sharing your rock hoarding story - I loved it! What an awesome hub! We've spent long hours on Michigan's upper peninsula collecting rocks. It's one of our favorite places to go. We also love Petosky stones found along Lake Michigan closer to Traverse City. This was really informative and has great tips! I love pretty rocks to place around my flowers and as I was preparing to type that I started wondering where they all have gone! Someone else must like pretty rocks too. Maybe my small grandson! Uh-oh! You caught me out! 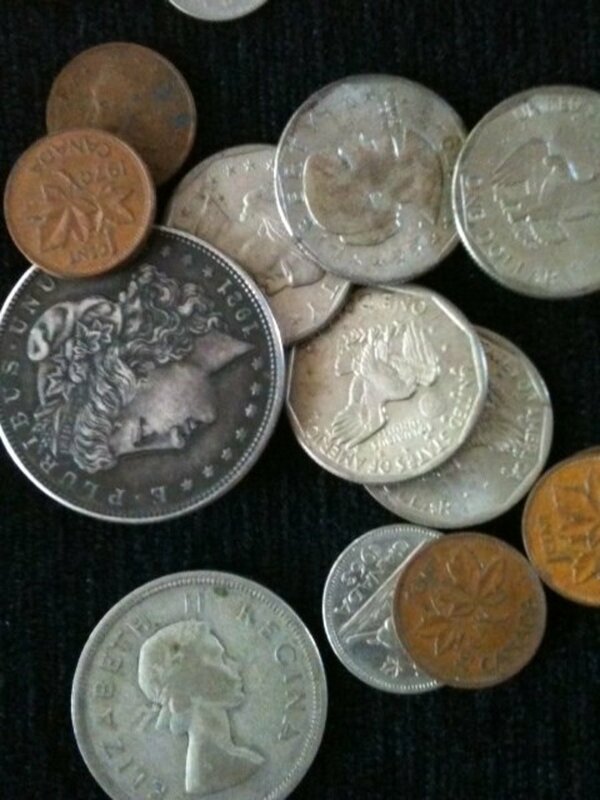 I admit to having both 'collections' and 'hoards' of rocks. It's all my mother's fault, you see. When I was a kid, we'd walk along the beach and she'd see a 'pretty white rock,' or a 'nice smooth rock,' and stick them in her pockets. Pretty soon, there was a box of rocks. We never did anything with them except to paw through them now and again. As I got older, I realized the pretty beach rocks looked rather plain and boring after they were dry, so we took to putting them in clear glass vases of water, so they'd show off their pretty colors and shine. When I was a kid, several of us were attracted to small white rocks, that for some unknown reason, we called, "Lucky Stones." When I took a geology class when my own kids were in high school, I picked up rocks on our field trips...oh, but that was "collecting specimens." Voted up, interesting,useful and funny...oh, and shared! Mhatter99 - Fossils and other rocks are fascinating to those who collect them. I have not heard the term, "bone head" before! 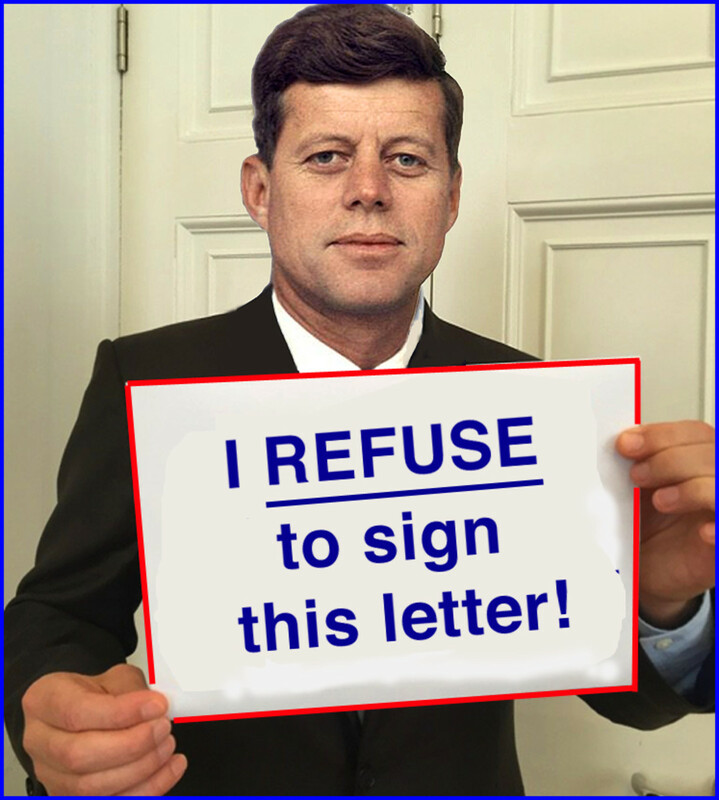 Thanks for stopping in to read and comment! I know somewhat what you are talking about, My son is a "bone head". Dinosaur bones, to me, look just like rocks. Thank you for this.